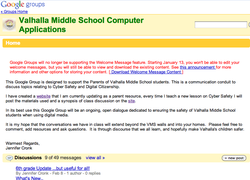 In an effort to better protect the children of the district I have hosted a Google Group for the parents of my students. Every lesson that deals with Cyber Safety topics is sent home to my network of parents so they and their children are more prepared to deal with the challenges inherent with today's technology. There is a dedicated section of my class site that only parents can access. This area hosts videos and other information that are imperative to student online safety but may be inappropriate to discuss in class. Using this tool the parents are well informed and can initiate important conversations with their children. I provide on my class site a way for all students to report instances of Cyber Bullying. All of my students have been taught how to report any incident that they find troubling. Our motto is "Stand up, don't stand by."